I posted a link for part I and here is the link for part II on his site incase you haven’t been there to read it yet. This is part two of my gns3 switching tutorial series. In part 1, you learned how to use a 16 port network module (NM-16ESW) to simulate many features of a Cisco switch. In this tutorial, you will learn how to configure vlans on the switch and how to route between vlans with a â€˜router on a stickâ€™ configuration. Jacob was born at 5:30 pm EST yesterday after a few hours of pushing by his mother. She did an excellent job! He was face up to start and that took a ton of pushing on her side to get him to roll over. He came in at 8 pounds, 4 ounces. This one will be short, I need to head back up to the hospital. In this tutorial, you will learn how to build a Cisco switching lab â€¦ even though GNS3 cannot emulate a Cisco switch. I will show you how to use an NM-16ESW network module in a 3640 router to emulate a switching environment. This tutorial is actually part one in a two part series. Part 2 will show you how to configure a â€œrouter on a stickâ€. A router on a stick is basically when a router is configured to route between two vlans with a single physical connection to the switch. I have almost made it through day 8 of the internetwork expert cod. This weekend was a total wash study wise though. Friday night we worked till around 2:00am doing a SQL server migration, which meant I slept most of Saturday away after being woken up a few times for work related things dealing with the migration. On Friday my wife had her weekly doctor’s apointment and they advised her that if the baby doesn’t come by August 5th, they will induce labor. This is kind of my fault lol. Since I am 6’4 I guess the baby decided he would be best served to start growing like his dad. The doctor scheduled a growth sonogram for this comingÂ Wednesday. Maybe they will decide they should just induce my wife this week based on his size ;). I also did received my full Blended Learning Solution from IP Expert. Thanks goes out to Mike Down over at IP Expert. I will have to start going through that material as well. I am kind of stuck in neutral right now though waiting on the wife :). One thing still on the table my wife really wants me to look into is taking a five day bootcamp. I am still uncommited to this. The cost alone is high. The cost to travel right now is insane, with fuel costs the way they are as well. The full benefit to cost ratio still doesn’t seem to add up to me. Plus with all the material I have on cod the current cost of everything just doesn’t seem to make sense. I must admit I skipped through some of day 7 of the cod. I moved right through the classes on authentication for OSPF, RIP, EIGRP. I have them down pretty much now. I am starting to get close to completing the cod which is starting to feel like an accomplishment itself with everything else that is going on. Due to the non-decreasing interest to the post about Private VLANs, I decided to make another one, more detailed â€“ including a diagram and verification techniques. To begin with, look at the concept of VLAN as a broadcast domain. What Private VLANs (PVANs) do, is they split the domain into multiple isolated broadcast subdomains. Itâ€™s a nesting concept â€“ subVLANs inside a VLAN. Next, as we know, Ethernet VLANs are not allowed to communicate directly with each other – they require a L3 device to forward packets between broadcast domains. The same concept applies to PVLANS – since the subdomains are isolated at level 2, they need to communicate using an upper level (L3/packet forwarding) entity – such as router. However, there is difference here. Regular VLANs usually correspond to a single IP subnet. When we split VLAN using PVLANs, hosts in different PVLANs still belong to the same IP subnet, but now they need to use a router (L3 device) to talk to each other (for example, by using local Proxy ARP). In turn, router may either permit or forbid communications between sub-VLANs using access-lists. Why would anyone need Private VLANs? Commonly, this kind of configurations arise in â€œsharedâ€ environments, say ISP co-location, where itâ€™s beneficial to put multiple customers into the same IP subnet, yet provide a good level of isolation between them. Internetwork Expert has opened a new forum/community that replaces their current forums. You can never get enough online community options. In order to provide the best possible service to our customers, and to the CCIE community as a whole, we have implemented a new combination web forum / mailing list server as a free service. Internetwork Expertâ€™s Online Community (http://www.IEOC.com) officially replaces our previous Discussion Forum as a place where you can discuss both general CCIE topics for all tracks as well as Internetwork Expert specific products. IEOC allows you to create new posts and reply to other posts like a normal web forum, but you can also read and submit posts via email! 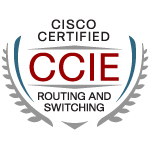 For example if you email ccie-rs@ieoc.com your message will be sent our to all users subscribed to the email feed, plus posted on the web forum as viewable and searchable content. Personally this is my favorite feature of the new server, as I dread checking web forums daily, but I am completely obsessed with checking my email every five minutes. My lab date is all set and ready to go as well. I am keeping that day a secret though until I see how studying goes for the first few weeks with a newborn in the house. I would like to move it up a bit if that becomes possible. I would like to show up in CCIE Pursuit’s lab, but he is taking it in San Jose.